IAQ is the only Indoor Air Quality consultancy in Singapore able to offer a full microbial testing and analytical service utilizing its own dedicated microbiological laboratory. Importantly, this includes the ability to identify the specific species of molds and bacteria present within a building’s internal environment. Indoor Air Quality (IAQ) is critical to the balance of a pleasant, safe, hygienic and healthy indoor environment. Few other ‘pollutants’ have the potential to reduce human quality of life and cause damage to buildings as do airborne micro-organisms and substances. For example, exceptionally high levels of otherwise innocuous non-pathogenic micro-organisms can cause unpleasant and even life-threatening symptoms in susceptible individuals and trigger allergic or asthmatic attacks. 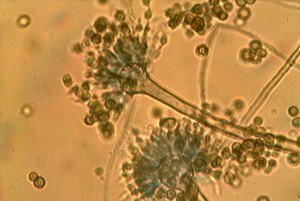 This phenomenon is often found with higher than usual levels of molds and fungal spores. Conversely, even very, very low numbers of pathogenic micro-organisms (such as Legionella) that can colonize and establish a foothold in an indoor environment can cause ongoing incidences of infection, illness and at worst, even death for anyone exposed to them. Sadly, such cases often only come to light after many people have become ill and the type of infection provides a clue to a shared, common origin and a common focal point of infection. Unfortunately, in this scenario, the source of the problem is discovered only by inspection and identification work after the event and it invariably triggers a reactive, high profile response with many negative repercussions. Every building, irrespective of its construction, contains and provides harbourage to large numbers of ubiquitous micro-organisms. In a well-balanced indoor environment microbial activity would normally remain at very low levels and co-exist within the habitat at innocuous levels. Microorganisms will live silently and unnoticed until the prevailing environmental conditions allow them to proliferate, unchecked, to hazardous or even life threatening levels. Therefore, it becomes abundantly clear that there is a significant need to pro-actively monitor, test, analyse, understand and then act upon Indoor Air Quality BEFORE the symptoms in the buildings occupants manifest themselves and cause unnecessary, unpleasant or even life threatening symptoms. When a person goes to their physician for diagnosis and treatment, or sometimes during a routine check-up, we would never expect our doctor to just simply say “you have fungi” or “you have bacteria”! We expect (and would even demand) that our physician undertakes all the necessary tests (laboratory tests, x-rays, imaging, reflex testing, etc.) essential to make an accurate diagnosis, explain the likely prognosis and then prescribe the necessary regime of treatment to alleviate the symptoms or cure the illness in question! Exactly the same logic applies to Indoor Air Quality. Before you can determine if an indoor environment is naturally safe or potentially dangerous, the necessary testing, analysis and diagnostics have to be undertaken. In recent years, the air quality of indoor environments is of increasing concern to everyone. Molds and bacteria are recognized health hazards, having been associated with health problems such as allergies, infection and mycotoxin poisoning. Being able to definitively identify the micro-organisms present and perhaps proliferating within a building is an absolute pre-requisite to understanding the problems and then articulating and implementing a species-specific remediation strategy. At IAQ, we take a very efficient, logical and structured approach to sampling, identification and diagnosis using some of the following techniques which can be broadly divided into ‘Air Sampling Methodologies’ or ‘Surface Sampling Methodologies’. Bioaerosol testing is performed with MAS-100 NT Air Sampler loaded with Malt Extract Agar (MEA) plates for fungal retrievals and Tryptone Soy Agar (TSA) for bacterial retrievals. The MAS-100 NT Air Sampler is a widely used and accepted device, which is calibrated to draw 100 litres of air per minute and trap the organisms onto the plate. Results are customarily reported as Colony Forming Units (CFU) per cubic meter of air. This methodology begins to identify the size and scale of the problem and can also focus the investigation onto more specific sampling and testing techniques. 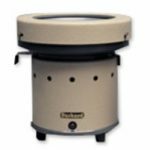 A Burkard Air Sampler is a compact unit with built-in vacuum pump, designed to capture, trap and sample airborne particles such as fungus spores and pollen continuously for long periods of time. Surface samples are collected from areas suspected of mold growth or from areas that presented visible stains using either bio-tape slides or swabs. 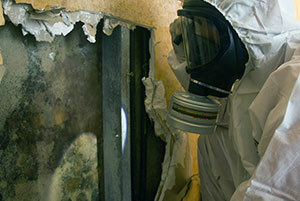 The slide is placed over the area of visible or suspected mold growth and the surface of the slide is lightly pressed. After collection, the Bio-tape slide is stained with lacto phenol cotton blue. The Bio-tape slide will be then observed under the microscope for further analysis. Generic swab samples can be collected from areas suspected of bacterial or fungal contamination or from areas that presented visible stains. 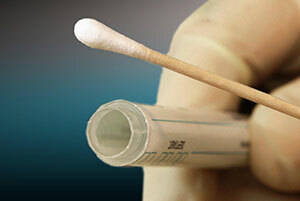 Swab samples can then be generically analysed for total viable counts (usually referred to as colony forming units) or specific indicator organisms for food spoilage or sewage contamination. Depending upon the results, further focused testing and analysis can be targeted to provide more accurate diagnostic results. 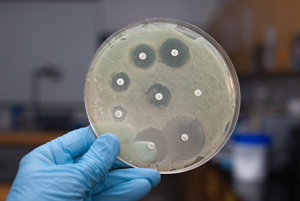 If IAQ’s preliminary testing and analysis suggests that there might be problems caused by the presence of pathogenic bacteria, then a more specific sampling, testing and speciation approach will be required. IAQ is the only Indoor Air Quality consultancy offering this capability as a rapid, in-house service. Accurate microbial identification requires significant and continuous process refinements, using timely updates from organism identification libraries that reflect current taxonomy and classification protocols and data. This sophisticated approach requires a familiarity and expertise in interpreting complex data and these attributes are only achieved with many years of practice and experience. IAQ has developed this invaluable in-house capability and is ready for immediate deployment for rapid results, meaningful interpretation and advice, thereby enabling swift or urgent remedial action as necessary.